The call out fee covers our travel to and from your pick up and delivery addresses. After that we charge hourly from door to door. The minimum booking is 2 hours, after which we charge half hourly. 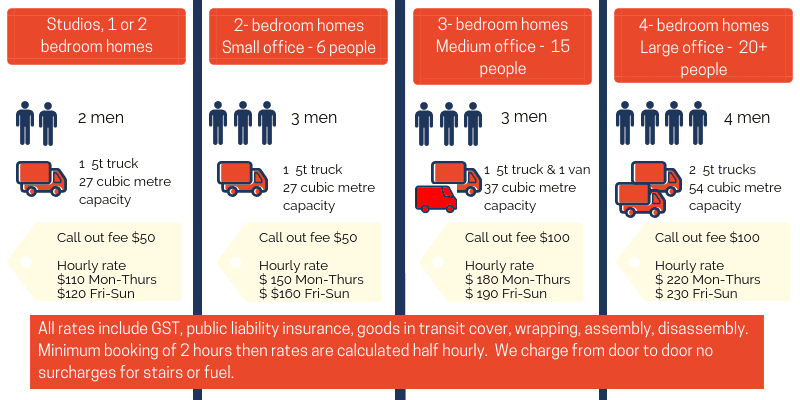 The prices include GST, public liability insurance, goods in transit cover. We do not charge additional or hidden fees for stairs or fuel. We assemble and disassemble furniture, wrap your mattresses, sofas, use blankets to protect your items. Our trucks are equipped with tools and equipment to pack and move studios, 1 bedroom, 2 bedroom, 3 bedroom and 4 bedroom houses, townhouses and units. We also move and relocate offices and businesses. Special items are subject to extra charges. Please read our Frequently Asked Questions for more information. If your selected time and date is not available we will provide the best alternative times available. Our corrugated boxes are made of strong recycled cardboard and have a double wall to protect your items. They are the ideal packing cartons for long-term storage and for short or long haul moves including interstate and regional moves. We sell and deliver moving boxes online through our shop here: Boxes and Packing Material or you may order them by email to book@vmove.com.au. We move pianos and snooker tables for an additional quote. Please send a photo of your item to 0474220573. Read our Frequently Asked Questions for more information. Ready to book or want a quote? Get a quote by completing ALL the information below. 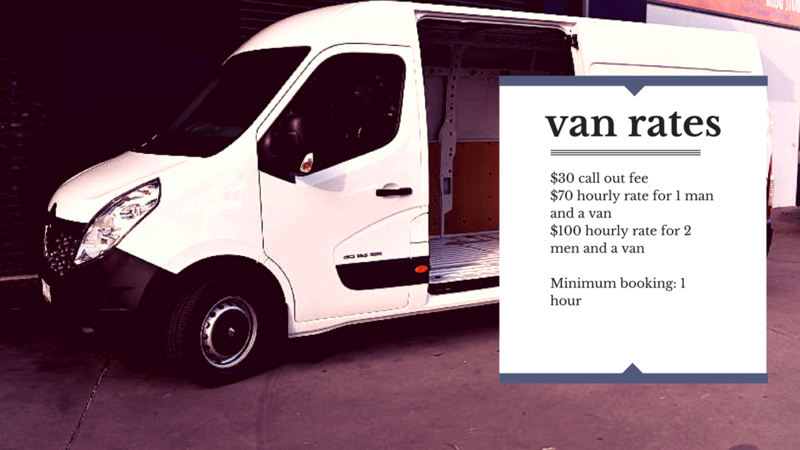 The quote is an estimate based on our hourly rate and on the information you provide, please be as accurate as you can. If your loading zone or garage are lower than 3.4m high, we must park onstreet or book an extra ferry vehicle such as a ute or van. Please check requirements with your building manager. *Please note if you choose the afternoon 2:30-3:30pm slot the exact time cannot be guaranteed and is highly dependent on the morning jobs. By selecting this slot you understand and accept that the team may be late. **Please note that our box shop and hire prices and policies apply.